Had it not been for two men in a small canoe over seventy years ago, the world may not have ever known the name John F. Kennedy said US Defense Attaché Commander Dan Balsinger. 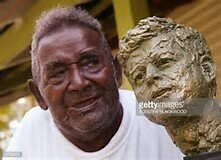 During the unveiling of John F. Kennedy’s PT109 monument on Lubaria Island in Rendova last week, the Commander speaking on behalf of the United States of America said they are deeply grateful for the actions of Eroni Kumana and Biuku Gasa that fateful August day in 1943. 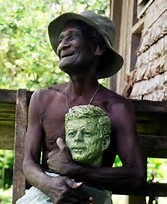 “We thank you for your friendship, and we thank you for this great honor to our 35th President, John F. Kennedy. “Again a great and mighty U.S. Navy ship will bear the name and carry on the legacy of President John F. Kennedy,” he said citing the first naval ship has been decommissioned in 2007. At the ceremony, Commander Balsinger also met up with one of late Biuku’s son Rex Biuku. He also met up with a one of the forgotten native in the Presidents’ version son of Ingolo Goete, claimed to be one of the head scouts that helped in the rescue effort in the Kolombangara waters. Aaron Kumana web page happy to receive a Computer for its Communication Programs. A Brother in-law of one of the Aaron Kumana’s grandson donated a computer for its communication activities. A second-hand computer but functioning very well was installed and continues to update its communication programs. The communication project is a continuous activity to update programs of activities that are happening in the family of late Aaron Kumana. With this setup, the family is looking forward to publishing its first Newsletter and will be named the “Eroni Kumana Newsletter”. This newsletter will educate and inform communities in and around our island. The Aaron Kumana (AK) family especially the grandsons has the struggle to fulfill their grandfather’s 5 Recommendation’s (5R’s) http://aronkumana.blogspot.com/2010/05/aaron-kumanas-5-recommendations.html, and with this gift, the number 5 of the 5R’s continued support. The web page is established and now we are looking forward to the newsletter. 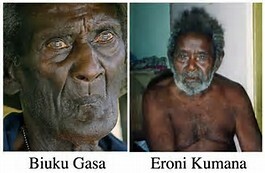 Eroni Kumana’a Grandson Defend Maloku Land. 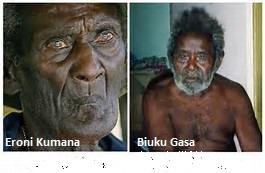 Eroni kumana’s Grandson defend Maloku customary land during the hearing of Timber Right on Maloku customary land. The grandson Rellysdom A. Malakana, speaking on behave of the chief and the tribe of Maloku and clients, families, tribes who are resided and benefit the land, he totally condemned the action of some people whom without a chief and tribal members who applied for the Maloku customary land to be logged. Women are also part of the gathering to dismiss the logging company. One of the Applicant standing and says why he apply for logging. Watching are the executive of the provicial government. Some of the clients who also dismiss the proposed logging. He said it is sudden to note that the applicants of proposed logging on the land of Maloku are not even the rightful land owners of the land. 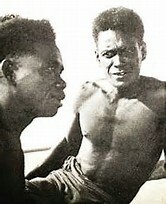 He stated that due to their selfish ambitions to exploit the peaceful existence of the people and the undisturbed forest and wild life, the rivers and streams that provide life to the people living the mountainous land, he totally asked to stop the logging company on the customary land of Maloku. Rellysdom Malakana said that there some small scale businesses like timber sawmill, copra, and root crop farming to earn living and it was very obvious that up to 70% of the area has been engaging by locals to produce their foods and also meet their basic needs. Villages continue to rely on local building materials to build their shelters. The majority of them goes as far the mountain peaks to access those materials and also to cut timbers for community buildings and also for themselves, said Malakana. The grandson highlighted the land boundary of Maloku, there exist tabu sites that are protected and preserved. He said these are culturally important sites kept because of their value and significance to the history of Maloku tribe. He calls on the other tribes, clients and communities resided on Maloku land boundary to come out and condemned the proposed logging company on the Maloku customary land.